This article is about the coalition government. It is not to be confused with the Conservative–Liberal Democrat coalition agreement. The Cabinet was made up of sixteen Conservatives and five Liberal Democrats, with eight other Conservatives and one other Liberal Democrat attending cabinet but not members. 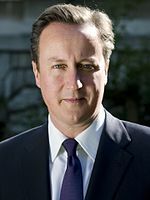 The coalition was succeeded by the single-party Cameron ministry after the 2015 general election. In the Conservative–Liberal Democrat coalition agreement of 11 May 2010, the two parties formed a coalition government. The new Parliament met on 18 May for the swearing-in of Peers in the House of Lords and newly elected and returning Members of Parliament in the House of Commons, and the election for the Speakership of the House of Commons. The Queen's Speech on 25 May set out the government's legislative agenda. Of the 57 Liberal Democrat MPs, only two refused to support the Conservative Coalition agreement, with former leader Charles Kennedy and Manchester Withington MP John Leech both rebelling. The Liberal Democrats had five Cabinet members including Nick Clegg as Deputy Prime Minister though after the Cabinet and ministerial reshuffle, David Laws, who was a Minister of State, was allowed to attend the Cabinet but was not a full member. If a Liberal Democrat minister resigned or was removed from office, another member of the same party would have had to be appointed to the Cabinet. Each cabinet committee had a chair from one party and a deputy chair from the other; there was also a cabinet committee specifically overseeing the operation of the coalition. Both parties' ministers shared collective responsibility for the government's positions, although the coalition agreement detailed several issues on which the parties agreed to differ; the Liberal Democrats abstained from voting in such cases. Clegg, as Deputy Prime Minister, took Prime Minister's Questions (PMQ) when Cameron was unavailable. While the government's front benchers sat together in the House of Commons and the two parties acted as a bloc during PMQ, the Liberal Democrat and Conservative backbenchers sat apart and each had their own whips, and the two parties competed in by-elections. On 4 September 2012, David Cameron reshuffled his cabinet for the first time. He reshuffled his cabinet for the second time on 14 July 2014. On 29 August 2013, the Conservative-led coalition suffered a defeat when Parliament voted against UK military attacks on Syria. On 19 October 2012, Andrew Mitchell resigned as Government Chief Whip in the House of Commons following controversy surrounding an argument with police officers in Downing Street. He was replaced by Sir George Young. On 7 January 2013, Tom Strathclyde resigned as Leader of the House of Lords and Chancellor of the Duchy of Lancaster. He was replaced by Jonathan Hill. On 7 October 2013, Michael Moore was replaced as Secretary of State for Scotland by Alistair Carmichael, during a reshuffle which focused on junior ministerial ranks. On 9 April 2014, Maria Miller resigned as Secretary of State for Culture, Media and Sport and Minister for Women and Equalities. She was replaced as Culture Secretary and Minister for Equalities by Sajid Javid, and by Nicky Morgan as Minister for Women. Morgan, who succeeded Javid as Financial Secretary to the Treasury, was not a full cabinet member but attended meetings in her role as Minister for Women. On 5 August 2014, Sayeeda Warsi resigned as Minister of State at the Foreign and Commonwealth Office, and as Minister for Faith and Community, in protest at the Government's response to the conflict in the Gaza Strip. She was replaced at the Foreign Office by Joyce Anelay, with Communities and Local Government Secretary Eric Pickles taking on Warsi's former Faith and Community brief. Adonis, Andrew (6 May 2013). "Cameron–Clegg: Three Years On". 5 Days in May: The Coalition and Beyond (1st ed.). Biteback Publishing. ISBN 9781849546058. Eccleston, Richard; Krever, Richard, eds. (27 January 2017). The Future of Federalism: Intergovernmental Financial Relations in an Age of Austerity. Edward Elgar Pub. p. 132. ISBN 9781784717780. Jowell, Jeffrey; Oliver, Dawn; O'Cinneide, Colm, eds. (1 August 2015). The Changing Constitution (8th ed.). Oxford University Press. p. 220. ISBN 9780198709824. Kickert, Walter; Randma-Liiv, Tiina (2015). Europe Managing the Crisis: The Politics of Fiscal Consolidation. Routledge. p. 114. ISBN 9781317525707. Peele, Gillian; Francis, John G., eds. (29 November 2016). David Cameron and Conservative Renewal: The Limits of Modernisation?. Manchester University Press. p. 48. ISBN 9781784991531. ^ "Nick Clegg appointed Deputy Prime Minister" (Press release). Office of the Prime Minister. 12 May 2010. Retrieved 3 February 2012. ^ "John Leech did not vote for the coalition - but who is the third man?". www.nextleft.org. ^ a b "Coalition government: Q&A". The Daily Telegraph. 14 May 2010. Retrieved 15 July 2014. ^ "David Cameron's right turn in cabinet reshuffle". The Guardian. 4 September 2012. ^ "William Hague quits as foreign secretary in cabinet reshuffle". BBC News. 14 July 2014. Retrieved 14 July 2014. ^ "Her Majesty's Government". Office of the Prime Minister. Archived from the original on 1 August 2011. Retrieved 15 July 2014. ^ "David Laws resignation: What next for government?". BBC News. 30 May 2012. Retrieved 5 May 2012. ^ a b "Liam Fox quits as defence secretary". BBC News. 14 October 2011. Retrieved 3 February 2012. ^ "As it happened: Liam Fox resigns". BBC News. 9 July 2011. Retrieved 3 February 2012. ^ "New Ministerial Appointments" (Press release). Office of the Prime Minister. 3 February 2012. ^ "Her Majesty's Cabinet". Office of the Prime Minister. 6 September 2012. Retrieved 6 September 2012. ^ "Her Majesty's Government". House of Commons Information Office. Retrieved 6 September 2012. ^ "Andrew Mitchell resigns following allegations he called police 'plebs'". The Guardian. 19 October 2012. Retrieved 19 October 2012. ^ "Lord Strathclyde resigns from cabinet". BBC News. 7 January 2013. Retrieved 21 August 2013. ^ "Sajid Javid named culture secretary after Miller exit". BBC News. 9 April 2014. Retrieved 22 May 2014. ^ "Ministerial appointments: July 2014" (Press release). Office of the Prime Minister. 15 July 2014. Retrieved 15 July 2014. ^ "Her Majesty's Cabinet". Office of the Prime Minister. 15 July 2014. Retrieved 15 July 2014. ^ "Baroness Warsi quits as Foreign Office minister over Gaza". BBC News. Retrieved 17 February 2016. ^ "Ministerial appointments: August 2014 – Press releases". GOV.UK. 6 August 2014. Retrieved 17 February 2016. Hazell, Robert; Yong, Ben (2012). The Politics of Coalition: How the Conservative–Liberal Democrat Government Works. Hart Publishing. ISBN 978-1-84946-310-2.